There have been several times in my life where I’ve thought why didn’t I learn this in school? I’ve often had this thought in regards to life skills like personal finance; why did it take going to college to learn key tips for managing money when many high schoolers could immensely benefit from these skills? There have also been times when I’ve realized that the way history was taught to us was not necessarily an honest picture of past events. There has been a discussion in recent years on the way we teach certain things, such as Thanksgiving and the discovery of the Americas (and consequently, on whether this holiday and Columbus Day should be celebrated). For many Americans, our teachers explained the history of Thanksgiving as a peaceful bread breaking between the pilgrims and the Native Americans. At the very least this telling of the story leaves out the fact that there is no historical evidence that Native Americans were even at such a feast. At worst, it glosses over the conflict that occurred between the two groups. As far as the discovery of the Americas, well, the credit does not belong to Christopher Columbus. 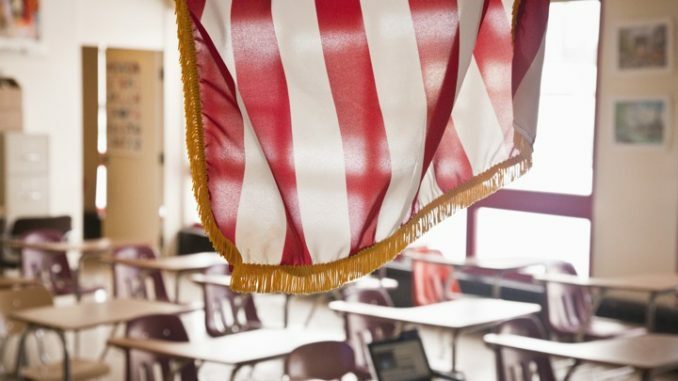 Why does American education sometimes get history wrong? Historian and author of the book Lies My Teacher Told Me, James W. Loewen, posits that there are several problems with the average public school teacher’s approach to history. For one, many public school teachers are not historians; teachers are not required to have specifically studied their subject area in order to teach it. This means that these teachers may not be particularly interested in history, in which case they are like to rely on a single textbook for their course material rather than gathering information from many sources. Loewen states that history textbooks are also part of the problem, as most simply state the facts without addressing the underlying causes of historical events (such as racism facilitating the American civil war). This is made worse by the fact that teachers will then test students in a way that encourages a regurgitation of the facts rather than in a way that asks students to think critically about why these events happened. Complicating things further is the fact that many of the things that happened in history are hard to talk about. Important topics can be hard to approach and challenging to adapt to the age-appropriate level of the class, and students may ask troublesome questions. Perhaps some teachers are just too lazy to step up to the task of dealing with these issues. I do want to clarify that I in no way believe that all teachers are like this; I know that there are some great teachers in public school, having had my fair share myself. However, I have also had my fair share of sub-par teachers, and it seems that much of America has too. Last week I had the experience of yet again realizing how much history my public school education had left out. In Professor Babarinde’s Regional Business Environment in Africa class, we discussed King Leopold II of Belgium. Leopold owned the Congo in the late 1800s and forced the people of the Congo into slavery in order to mine resources and obtain ivory with which he grew his own personal wealth. He did this through horrific violence and genocide. 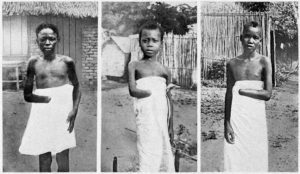 By the time Leopold was finished with the Congo the population is estimated to have been cut in half. One of the articles I came across stated that he comes third in terms of number of people killed only after Hitler and Stalin. I had never even heard his name before last week. I learned about Hitler and the Holocaust in depth in school, and I learned about Stalin, though perhaps not to the same extent. But not one of my history teachers in my K-12 education taught me about Leopold. I even read the book Heart of Darkness for one of my high school English classes, but it wasn’t until last week when I did my own research on Leopold that I realized that the book is based on real events. The English teacher that assigned it had only talked about the symbolism for humanity’s evils, not the history that had inspired the novel. The fact that American education discusses Hitler at length but doesn’t even mention Leopold is concerning if nothing else. Maybe it can be argued that Leopold was not mentioned because his actions didn’t involve a world war the way the events of the Holocaust did. But if anything, shouldn’t we be asking the question of why that is? Why did the entire world care enough to intervene on Hitler but not Leopold? Of course, Western powers did eventually intervene in the Congo, but it didn’t result in independence for the nation until 1971, almost 65 years after Leopold ceded the land to the Belgian government. Conflict and unrest still largely exist in the Congo today. Perhaps the truth lies in the fact that what Americans are taught in history is often designed to paint America in a positive light. 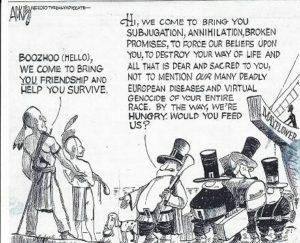 America likes to think of itself as the “hero” or the one that saves others from terrible fates. We justify our invasion of other countries because we believe so strongly in our values of independence and freedom that we must help other nations achieve those same goals. The decision not to act in regards to the Congo hardly fits that narrative. One author writes that the selection of course material for American education has more to do with a narrative of white supremacy. It begs the question: why it is that when a leader commits mass genocide of a marginalized group of white people he goes down in history as one of the most evil men ever to exist, but when the same level of genocide is committed to Africans, many people don’t even know his name? The thinking that lead to Leopold’s rule of the Congo has its origins in colonialism: the so-called need to “civilize” the African continent. Its impact is lasting; this kind of thinking prevails in the white supremacists of today, but most probably don’t even realize where this thought process comes from. The majority of what American public education teaches about Africa is not about the horrific consequences of colonialism. Thus, as author James W. Loewen argues, many people do not understand the causes of important, terrible events and how they led us to where we are today. These topics and the questions they pose for American education are difficult, but they must be approached for any hope of a better future, one in which we actually learn from the mistakes of the past. History teachers need to rise to the challenge of educating their students on the truth, not glossing over hard to discuss topics, not leaving out important events if they don’t fit a certain narrative, and encouraging students to think critically about the causes of historical events instead of just memorizing the facts. America fails its students, the best hope for a brighter future, when history is eliminated from curriculum or taught incorrectly.